For the pond season we stock a variety of fish and plants. For pond fish we have usually have various types of goldfish, which includes, Sarassa Pond Comets, Shubunkins, Fantails, Moors and others. We also stock a variety of koi in both standard and butterfly. 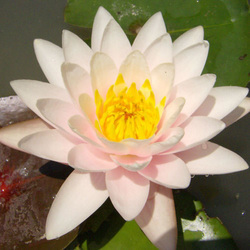 We also usually have a wide variety of pond lilys and other hardy pond plants. We sell a wide selection of pond products to build a new pond or to maintain an existing pond. This includes liners, preformed ponds, pumps, tubing, fountains, filters, prefilters, waterfalls, uv sterilizers and other pond equipment and additives to keep your pond running smoothly.